Tiffany Prinster is the co-owner and CEO of DIY HCG (Do-It-Yourself HCG), the Internet's #1 most trusted site for Do-It-Yourselfers on the HCG Diet. After leaving the University of Missouri Kansas City's Six Year Medical Program (because she couldn't imagine spending the next 6 years in a hospital under someone else's schedule), she pursued her B.A. in Philosophy. Tiffany love spending time with her family (she is the oldest of 8 children) and her friends. Her passions are self-growth, creativity, entrepreneurship, and anthing that makes her laugh. 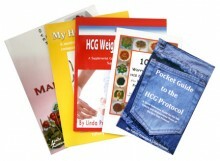 and the other HCG Books Click Here!